The Holy Name Society promotes devotion to the Holy Name of Jesus, promotes the Spiritual welfare of the men of the parish, and celebrates Mass together on the first Sundays of the month and retreats. Social events include Casino Night, Christmas Dinner, Mardi Gras and the Annual Banquet. Service events include soup supper, blood drives, driver training and Mass transportation. Recent donations were given to: Faith Formation, CYO, Altar Servers, Garden Ministry and Youth Ministry. 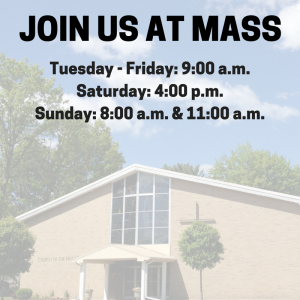 We invite all men of the parish to join and help us build a more dynamic parish. For additional information or to join, please contact Brian Valentine at 754-8509. All meetings start at 9AM in Room 2 except where noted.